Dolores Hayden’s poetry collections are American Yard (2004) and Nymph, Dun, and Spinner (2010). Recent work appears in Poetry, Raritan, The Yale Review, Shenandoah, Best American Poetry, and American Scientist. She’s won awards from the Poetry Society of America and the New England Poetry Club and been a poetry fellow at Djerassi and the Virginia Center for the Creative Arts. She is also the author of several non-fiction books on American urban landscapes including The Power of Place and A Field Guide to Sprawl. At Yale University, she teaches a class called “Poets’ Landscapes.” Her web site is www.DoloresHayden.com. It’s hard not to ache for the house as it’s being demolished. The poet takes pains to personalize it (“clapboard skin,” a chestnut skeleton), which makes the speaker sound callous, shortsighted. But Hayden leaves out what’s to become of the cleared property and in so doing, doesn’t seal the builder’s indictment. Instead she gives us that amazing line from Frost. Flowers are most beautiful during their bloom, but that time “after the petals go” is part of their life cycle, too. If the speaker is wrong about anything, it’s that “masonry is nothing like a flower.” Even without being pulled down by the builder, the house would eventually have succumbed on its own, just like Old man Smithson. 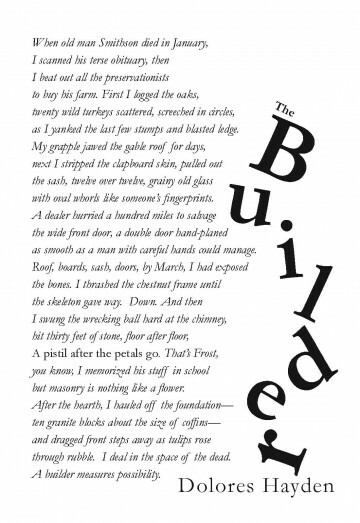 So the poem becomes a Rorschach test for the reader: is the builder blindly violent, or will the “possibility” he measures rise like “tulips…/ through rubble”? The poem isn’t just another demolition story for this builder, it’s part manifesto, part apologia. It’s personal, so the body of the text needed a similar intimacy, an italic lean forward as if the letters were as eager to tell this tale as the builder himself. Garamond offers an easily legible italic that mixes well with its own roman, allowing the quote from Frost to feel solid amid the story of the tumbling house and letters of the title. All these elements together vibrate on the page, a visual irony to go with the poem’s verbal one.